Training (MPT) is a progressive and diverse mariner helps achieve that. ally, liquid cargo simulations are becoming increasing- training center, long-tenured and regularly investing in ly important in the industry. How have attitudes toward maritime simulation train- the latest systems and supplied to keep its broad-based ing evolved over the past few years? We understand you had an interesting recent project clientele coming back. Capt. 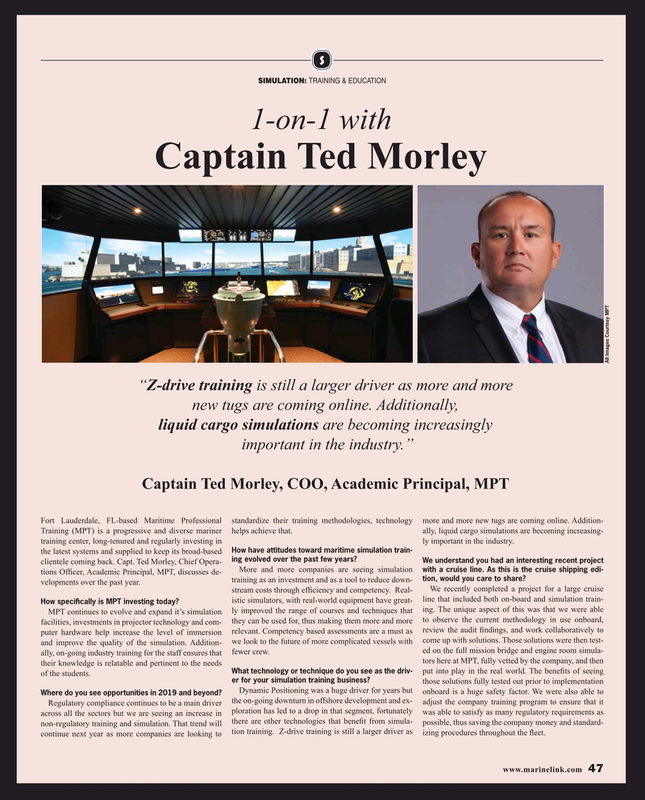 Ted Morley, Chief Opera- with a cruise line. As this is the cruise shipping edi- More and more companies are seeing simulation tions Of? cer, Academic Principal, MPT, discusses de- tion, would you care to share? training as an investment and as a tool to reduce down- velopments over the past year. How speci? cally is MPT investing today? What technology or technique do you see as the driv- put into play in the real world. The bene? ts of seeing of the students. er for your simulation training business? Where do you see opportunities in 2019 and beyond?